Over the last month I spent time thinking about E3’s 2015 presentations and digital events, and how some people weren’t happy that they didn’t get everything they wanted out of Nintendo. (Metroid and Animal Crossing fans feeling especially burnt). I wanted to give some time for the hype poisoning to wear off before saying anything…but then over the weekend I and the rest of the game-playing world got news that really blunted my desire to talk about expectations. Satoru Iwata, President of Nintendo and programming genius, passed away from a bile duct growth caused by cancer at the age of 55 a couple days ago. I don’t really think anybody expected it. I mean, I knew he was sick but I didn’t know it was cancer, and it’s a very Japanese businessman thing to be working up until the end. It certainly puts a lot of E3 2015 in a different light though, the puppets, the theme of “transformation”, and so on. Perhaps Iwata knew he didn’t have long…perhaps he didn’t want us to worry. Unfortunately I feel we’re all worried now. Better gamers, game developers, and press people will be able to sum up Iawata’s life better than I can, but I do want to stress a few things. First off, he was a genius programmer. Apart from being the man known for creating things like Baloon Fight and Kirby, he’s also the man who single-handedly reprogrammed Earthbound, saving it from cancellation. He ported Pokemon Red and Blue’s battle code over to the N64 for Pokemon Stadium without any sort of documentation in what amounted to his free time (he wasn’t even on the team) . He created compression tools for Pokemon Gold and Silver so that they could fit both the Kanto and Johto regions into a single Game Boy Game Pak. His first act as president of Nintendo when he assumed the role in 2002 was to put himself on the team for Smash Bros. Melee in order to make sure they hit their launch window. He even helped Smash Bros. exist in general, helping Sakurai win over Miyamoto’s initial fears and objections. Secondly, he was a great company president. As much as we on the Internet lean on memes and things like “Please Understand”, Iwata was definitely a rare breed among CEOs, even in the Entertainment industry. He put himself as the public face of Nintendo, an affable man who interviewed developers, gave news directly to us, and who wasn’t above doing silly things like having a simulated fight between himself and Reggie Fils-Aimé (President of Nintendo of America) for Nintendo’s E3 Digital Event of 2014. On the business side he also turned Nintendo around from its slump in the early 2000s, and even personally took pay cuts when the 3DS and Wii U didn’t meet sales expectations. He also resisted attempts to make Nintendo go mobile for as long as possible, and while some of that is happening now, it doesn’t seem to be their big focus. Lastly, in keeping with his quote from GDC 2005, he was a gamer. I feel this was important to the other two elements, making sure he could do what he could to make games come out on time, make sure they were fun. Even if Nintendo didn’t hit the mark every time in the past, I feel like they’ve at least tried their best and hardest to make a fun game, and that Iwata was a big part of it. Unfortunately he’s now gone, Nintendo’s in a weird place, and we don’t know what will happen next. My hope is that they don’t go the way of Sega and completely get out of console development. Given that the NX is on the horizon, I’m guessing they’ll still be developing systems for at least one more generation. Ultimately though I don’t think Iwata would want us to be mournful. Yes it’s intensely sad and depressing that someone so talented is gone from the world, but he’s left us a legacy. A legacy of games and of friendliness. Despite the somewhat cutthroat nature of the video game industry, here’s someone who did his best to be as personable as possible at all times, even to rivals. This probably hits everyone so hard because this is one of the first “big names” in an industry so young to pass away. I myself admit I always thought Miyamoto would be the first (well, second after the untimely passing of Game Boy creator Gunpei Yokoi) big name in Nintendo to go, just based on his age. Unfortunately that day will happen, just as the day will come where Sid Meier is no longer around, or John Carmack, or any other number of famous developers. It happens. Life happens, Death happens. We don’t really get extra lives, or continues, or a battery backup save-state. But I think everything will be fine. We can’t change the fact that Iwata is gone. But we can remember him well. I don’t know if there’s an afterlife, but if there is, I’d like to think he’s up there now, having ridden those two red balloons up to the gates, or some other metaphor based on one of the games he made if that doesn’t work for you. Yes it’s cheesy, but it’s how we cope. 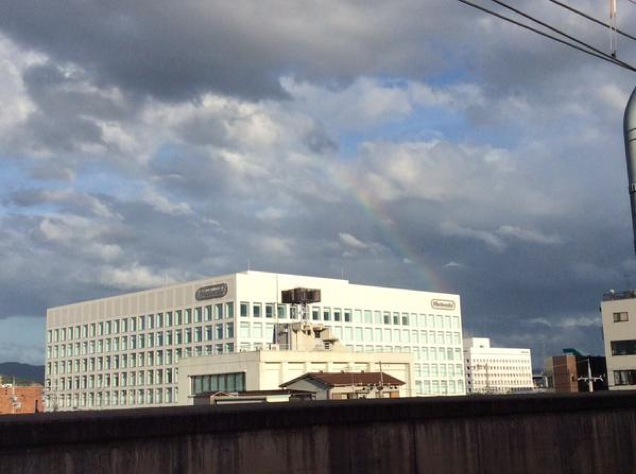 Also this is what the Nintendo HQ looks like right now. So maybe there is still some magic in the world. Nintendo, roughly translated, means “Leave Luck to Heaven”. Hopefully Heaven still has luck to give.